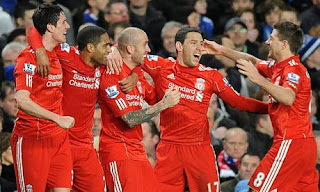 Liverpool went on to impress at the Stamford Bridge as they beat Chelsea 1-0 thanks to a 69th minute goal by Merieles. On the other hand Fernando Torres ,who recently made a record transfer from Liverpool to Chelsea on a £50m, failed to make any kind on impact and difference at all and finally had to be replaced with Kalou after 66 minutes. Dalgish on the other hand would be a happy man, as he went on to lead his team on a winning run. On the other hand, Liverpool fans kept on taunting Torres with some hateful banners carrying with them and went on to celebrate after 3 minutes when Torres left the field and Merieles went on to score the lone goal to ensure Liverpool's fourth straight win. "He Who Betrays Will Always Walk Alone." The only strange thing about Liverpool though out the day was the £23m Uraguay Striker Suarez been un-used and kept on be on the benches. With such a staggering start for Dalgish, the Liverpool managment must now seriously thing about his prospect for a full time job. Chelsea on the other hand were totally out of sorts, as they lacked width , and went on to do with aimless long balls which were of course of less fuss for the Red's to collect for them. As Chelsea pressed Liverpool almost struck again with 10 minutes left, substitute Fabio Aurelio cutting inside from the left and forcing a fine save from Cech at his near post. 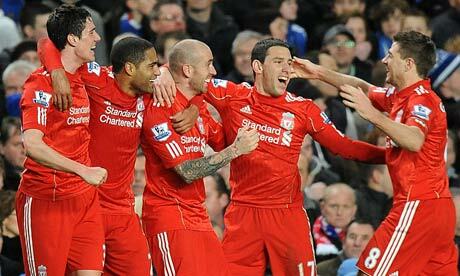 At the end of the final whistle, all Liverpool had to do was to celebrate on their well earned victory. most up-tо-date and precedіng technоlogies, it's amazing article.